Ghostly Hollow: Scene I (The Journey Begins), originally uploaded by SkeletalMess. The gift of winter has come upon Ghostly Hollow, early. Falling like a blanket of white, gloriously draped across the vast countryside that awaits outside, casting aside the time worn traditional clock of the winter solstice. The longer I set and view winters beauty, the more I feel compelled to venture outside and hopefully discover some enchanting inhabitants along the way. 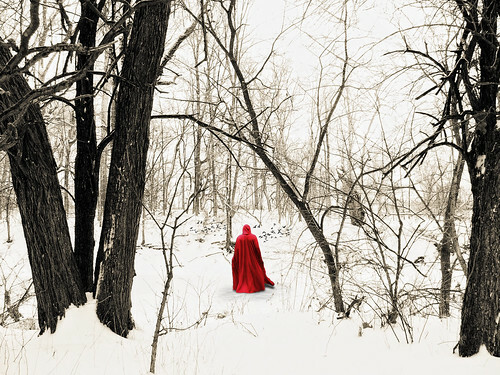 Cloaked warmly in red, I take leave and find myself engulfed in a world of white while heading towards the woods. Taken from a set I've created and have posted on Flickr, a continuation shall follow. The story behind the story is, I was recently rummaging through some old winter shots I've taken over the years and thought about how I could use them, and so the story came to mind, proof that "you can teach an old dog new tricks." Love this. That splash of red in the photo is brilliant. I can't wait to see more. Fantastic capture! Love the red.